Barack Obama said the way to peace between Israel and Palestine is for Israel to move its borders back to the pre-1967 Six Day War lines. Such a dishonest stance for any person, world leader or not, is astonishing, unless you support the demise of Israel. Here is a simple, truthful and easily understood reminder of those borders – usually, and conveniently ignored by those who accuse Israel of “occupying” Palestinian territory. 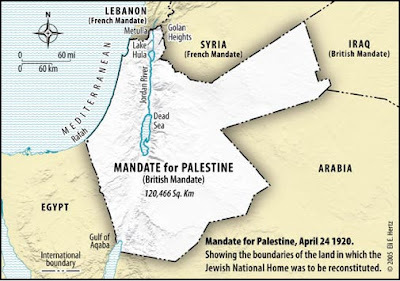 The original Mandate for Palestine, agreed to unanimously by the League of Nations in 1920, designated 124,466 sq. km. for the Jewish National Homeland, to be known as Israel. Israel did not receive that territory – but legally, the territory is still theirs today. Two years later, that 124,466 sq. km. had been reduced to 28,166 sq. km., as requested by the British trustees and approved by the League of Nation. 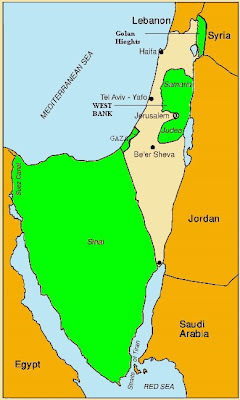 The remaining 77% of the land originally proposed for the Jewish homeland was to become the Arab state of Jordan. The creation of an Arab state in eastern Palestine (today Jordan) on 77 percent of the landmass of the original Mandate intended for a Jewish National Home in no way changed the status of Jews west of the Jordan River, nor did it inhibit their right to settle anywhere in western Palestine, the area between the Jordan River and the Mediterranean Sea. The Jewish homeland was to consist of all the land west of the Jordan River, stretching to the Mediterranean Sea – and including the West Bank and the Gaza Strip. The the Arabs would not have it. The League of Nations dissolved into the United Nations and the problem was handed over to the U.N., including the trusteeship of the British mandate to make a Jewish state a reality. The Mandate stood. The U.N. partition began. More land was taken from the Jewish homeland. The partition plan took on a checkerboard appearance. This was largely because Jewish towns and villages were spread throughout Palestine. This did not complicate the plan as much as the fact that the high living standards in Jewish cities and towns had attracted large Arab populations. This demographic factor insured that any partition would result in a Jewish state that included a substantial Arab population. Recognizing the need to allow for additional Jewish settlement, the majority proposal allotted the Jews land in the northern part of the country, Galilee, and the large, arid Negev desert in the south. The remainder was to form the Arab state. These boundaries were based solely on demographics. The borders of the Jewish State were arranged with no consideration of security; hence, the new state’s frontiers were virtually indefensible. Overall, the Jewish State was to be comprised of roughly 5,500 square miles and the population was to be 538,000 Jews and 397,000 Arabs. The Arab State was to be 4,500 square miles with a population of 804,000 Arabs and 10,000 Jews. Though the Jews were allotted more total land, the majority of that land was in the desert. 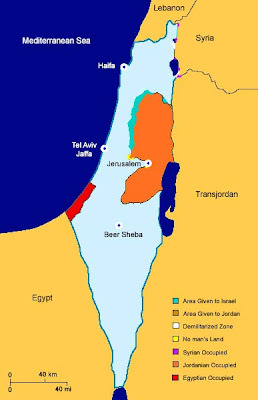 Israel’s land which was originally mandated at 126,000+ sq. km., was now to be a mere 14,245 sq. kms. In addition to limiting Jewish lands, the immigration of Jews was also limited so that a majority of Jews in the land would never be accomplished. Arab immigration had no immigration restrictions. Israel accepted the partition, but in reality, it did not change or diminish the legality of the lands mandated for Israel – which still included the West Bank and the Gaza Strip – BECAUSE, the Arabs would agree to nothing which facilitated Jews in Palestine. Creating the Arab state of Jordan in no way affected or “changed the status of Jews west of the Jordan River, nor did it inhibit their right to settle anywhere in western Palestine, the area between the Jordan River and the Mediterranean Sea.” Nothing from the time of the Mandate until today, changes the fact that under international law, the West Bank and Gaza is open to Jewish settlement. Under international law, neither Jordan nor the Palestinian Arab ‘people’ of the West Bank and the Gaza Strip have a substantial claim to the sovereign possession of the occupied territories. The UN Charter’s Article 80 implicitly recognizes the “Mandate for Palestine” of the League of Nations. The International Court of Justice has reaffirmed the validity of Article of 80. In other words, neither the ICJ nor the UN General Assembly can arbitrarily change the status of Jewish settlement as set forth in the “Mandate for Palestine,” an international accord that has never been amended. All of western Palestine, from the Jordan River to the Mediterranean Sea, including the West Bank and Gaza, remains open to Jewish settlement under international law. The Arabs accepted nothing. They wanted no Jews in Palestine, under any circumstance – there would be, to this day, no acceptable plan to which Arabs would agree to living next door to Jews. On May 14th, 1948, a temporary legislature of the soon-to-be Israel, accepted the U.N. partition and declared statehood. Eleven minutes after, the United States recognized the State of Israel. On May 15th, 1948 Egypt, Iraq, Lebanon and Syria invaded the sovereign nation of Israel, crossing international frontiers, and the Arab-Israeli War (Israeli War of Independence) began. By July 24, 1949, Syria had signed an armistice agreement and Israel had increased it’s land area by almost 50% over the U.N. partition plan. The resulting armistice determined Israel’s borders for nineteen years. Egypt gained Gaza in the armistice. This document offers good discussion and links to maps that your browser may find satisfactory (mine did not). By Fall 1949, Jordan had control of Gaza and East Jerusalem. The odd and secretive 1956 War began. The short but incomplete story is that Israel took Egypt’s Sinai Peninsula, and then under threat by the U.S., gave it back. Egypt, Syria, Iraq, Jordan and Saudi Arabia formed a “defense pact.” Egyptian President Nasser said “Our basic objective will be the destruction if Israel. Under the leadership of Moyshe Dayan, Israel decided to go to war on June 5, 1967. After a three days of fierce fighting, especially in and around Jerusalem, Israeli forces defeated the Jordanians and gained control of all of Jerusalem as well as the West Bank, the historical heartland of the Jewish people known to Israelis as Judea and Samaria. Following an air attack by the Syrians on the first day of the war, Israel dealt a shattering blow to the Syrian air force. …on fifth day of the war, the Israelis mustered enough forces to remove the Syrian threat from the Golan Heights. This difficult operation was completed the following day, bringing the active phase of the war to a close. The aftermath of the war was complicated, but one fact was all too simple: Arabs rejected all diplomatic attempts. Some of [the] displaced people were able to return to Israeli-controlled West Bank and, along with their neighbors, witnessed unprecedented economic growth over the course of the next two decades. Israeli investment into the infrastructure of the West Bank and the Gaza Strip, coupled with policies that allowed Arabs to move freely increased the standard of living of Palestinians, who were now able to work both in Israel and in the oil rich countries in the Middle East. After years of relative prosperity followed but Palestinians and the Palestinian Liberation Organization (PLO) insisted that they would replace Israel, not co-exist with her. With continued PLO agitation of the people, violence became common. Israel made peace with Egypt and returned the Sinai. The 1993 failed Oslo Peace Accord had Israel giving up the Gaza Strip and the West Bank – which was accomplished with Israel’s withdrawal, including the ejection of Jewish residents in the area in 2005. Once out of Gaza, nothing changed. The terrorists of Gaza Strip became slumlords and violence against Israel has continued. Palestinian militants—with the support of their Hamas-led government—have used the evacuated territory to launch rockets into Israel’s pre-1967 borders, shelling residents of Sderot and other neighboring communities and causing death, injuries and damage within Israel. Since Israel’s withdrawal from the Gaza Strip, the territory has also become the site of deadly internecine violence among Palestinian factions, kidnapping of journalists, vandalism, looting and general mayhem. Far from bringing peace to the Gaza Strip, the withdrawal has resulted in less secure borders for Israel. How could they succeed when Palestinian leadership remained and remains committed to the destruction of Israel? Those deluded into thinking that terrorist organizations Hamas and Fatah will accept “peace” with Israel, and co-exist next door to her – if only Israel will remove all settlements from wherever they may be, please rethink this issue, and believe the words of Palestinian leadership, which says it will never happen. The issue is not the Jews in the settlements. The issue is the Jews in the Middle East. No discussion of the Israeli-Arab conflict is complete without taking a look at the Palestinian people. Who are they? Who did they evolve from? 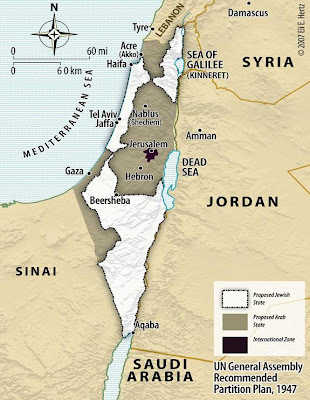 Palestine is a name coined by the Romans around 135 CE from the name of a seagoing Aegean people who settled on the coast of Canaan in antiquity – the Philistines. The name was chosen to replace Judea, as a sign that Jewish sovereignty had been eradicated following the Jewish Revolts against Rome. In the course of time, the Latin name Philistia was further bastardized into Palistina or Palestine. During the next 2,000 years Palestine was never an independent state belonging to any people, nor did a Palestinian people distinct from other Arabs appear during 1,300 years of Muslim hegemony in Palestine under Arab and Ottoman rule. During that rule, local Arabs were actually considered part of, and subject to, the authority of Greater Syria ( Suriyya al-Kubra). Archeologists explain that the Philistines were a Mediterranean people who settled along the coast of Canaan in 1100 BCE. They have no connection to the Arab nation, a desert people who emerged from the Arabian Peninsula. This is substantiated in countless official British Mandate-vintage documents that speak of the Jews and the Arabs of Palestine – not Jews and Palestinians. The Jerusalem Post, founded in 1932, was called The Palestine Post until 1948. Bank Leumi L’Israel, incorporated in 1902, was called the “Anglo-Palestine Company” until 1948. The Jewish Agency – an arm of the Zionist movement engaged in Jewish settlement since 1929 – was initially called the Jewish Agency for Palestine. Today’s Israel Philharmonic Orchestra, founded in 1936 by German Jewish refugees who fled Nazi Germany, was originally called the “Palestine Symphony Orchestra,” composed of some 70 Palestinian Jews. The United Jewish Appeal (UJA) was established in 1939 as a merger of the United Palestine Appeal and the fund-raising arm of the Joint Distribution Committee. The Arabs never established a Palestinian state when the UN in 1947 recommended to partition Palestine, and to establish “an Arab and a Jewish state” (not a Palestinian state, it should be noted). Nor did the Arabs recognize or establish a Palestinian state during the two decades prior to the Six-Day War when the West Bank was under Jordanian control and the Gaza Strip was under Egyptian control; nor did the Palestinian Arabs clamor for autonomy or independence during those years under Jordanian and Egyptian rule. The population of Lebanon, Syria, Jordan and Iraq did not “evolve,” but were created by “colonial powers.” No “Palestinian DNA exists! In 1919, in the wake of World War I, England and France as Mandatory (e.g., official administrators and mentors) carved up the former Ottoman Empire, which had collapsed a year earlier, into geographic spheres of influence. This divided the Mideast into new political entities with new names and frontiers. The prevailing rationale behind these artificially created states was how they served the imperial and commercial needs of their colonial masters. Iraq and Jordan, for instance, were created as emirates to reward the noble Hashemite family from Saudi Arabia for its loyalty to the British against the Ottoman Turks during World War I, under the leadership of Lawrence of Arabia. Iraq was given to Faisal bin Hussein, son of the sheriff of Mecca, in 1918. 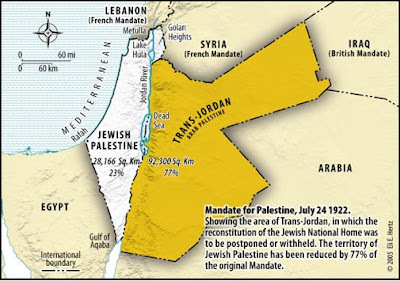 To reward his younger brother Abdullah with an emirate, Britain cut away 77 percent of its mandate over Palestine earmarked for the Jews and gave it to Abdullah in 1922, creating the new country of Trans-Jordan or Jordan, as it was later named. The conclusion: don’t waste your energy and your angst blaming Israel for stealing the homeland of the Palestinians. Don’t obsess over the dead and dying in Palestine. The time has come to recognize that Palestinian leaders have gravely failed their own. The millions of dollars of aid to feed and clothe the poor and oppressed seldom get to the people. Philanthropy buys weapons and means to attack Israel. Westerners supporting Palestine believe that if Israel will only turn over their settlements to Palestine, Israel and Palestine will live side-by-side in peace. This is inane and vacuous thinking. It is the willing suspension of disbelief. It is pure anti-semitism. Serious thought cannot arrive at such a conclusion. The PLO Charter Article 15 calls the liberation of Palestine a national (qawmi) duty to repel the Zionist and imperialist aggression against the Arab homeland, and aims at the “liquidation of the Zionist presence” in Palestine. The Hamas Charter: “The Day of Judgement will not come about until Moslems fight the Jews (killing the Jews), when the Jew will hide behind stones and trees….Hamas Charter Article 15 (a portion): “The day that enemies usurp part of Moslem land, Jihad becomes the individual duty of every Moslem. In face of the Jews’ usurpation of Palestine, it is compulsory that the banner of Jihad be raised. How does a non-Muslim supporter of Palestine ignore a terrorist-led government, terrorist aggression against Israel, and government Constitutions and Charters with a clear goal of wiping Israel off the face of the earth? Tell me, how does a Westerner give half-hearted support to Israel? Jim Hoft, Gateway Pundit has more on handing the most sacred sites in Judeo-Christian history to Palestinians. Note: some of the above is from my previous post on The Angst of Supporting Israel. This post has been nominated as a non-council submission by a Watcher of Weasels Council Member, Terresa Monroe-Hamilton at Noisy Room. Thank you for the honor. Watcher’s Council Nominations – Supporting Those Pre ’67 Lines Edition | Virginia Right! Watcher of Weasels » The Council Has Spoken!! The Jewish people were the original Palestinians. Very good history lesson. Carl, have you read Joan Peters’ From Time Immemorial? Obama and his Muslim cronies will convince the UN to comply. It’s all about who’s in control. Outstanding, remarkable research job – I learned so much from this. Kudos! A fantastic history lesson. Should be reading 101 for anyone who thinks they know the background on this very complicated story. Seldom have I seen this subject so well laid out in very understanding terms. RR, thanks for linking, and thank you so very, very much for posting while I was away. Great job Maggie. I read this last night and it was an extremely informative. I’ll make sure I link to it in our Teeing it Up post. Thanks John for the kind comment. I always appreciate your links and must get more round-ups done myself. Classic Film and Geo – thank you for those wonderful comments! Just made my day. Wow, what a post. A true history lesson that tells the real truth about the Jewish people and their homeland. It should be required reading and I would even go so far as to suggest that the man now living in the White House would do well to memorize it. Larry, I appreciate your comment so much. Thank you. I would love to get into Middle Schools and try to teach this stuff. I thank you for your very hard work on this piece. It has answered many of my own questions. Woody, thanks so much for coming by and for that very kind comment. This is an outstanding post, Maggie! What a great history lesson! It is pretty obvious that Obama & Co. are promoting the demise of Israel. Their sympathies lay with Muslims. Teresa, thank you! Your comment that Obama’s sympathies lay with Muslims is so true. It was so plain before the election. Everyone connected to him, and all his family roots are Muslim. What else would we expect, but he was elected anyway. Phantastique! Lady Girl – you rock! Congrats on the Council win! I don’t believe the responses on this site. Not a single negative one. That seems odd to me. zdeville, Since the post is backed-up by truth, there is little to be negative about. It cites history.